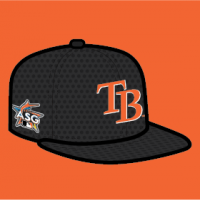 The bottom right is the only one that's an upgrade over the current on-field cap but I wouldn't even wear it with every jersey. The BP cap is way better than all of them anyway. The Rockies look great! I love the “CR” home and the sleeve striping. The dividing of the “Los Angeles” is creative for sure, I’m not quite sure how I feel about it yet. My one hesitation is that it makes it look more like a script that I wish the Angels had. The Padres have the making of a classic identity. The shades of brown & yellow you chose look a bit too “natural” to me if that makes sense, but the striping and logo designs are all great. I love the Giants set, especially how the script looks on the black alt. Well done as always, this has been a creative and unique series that I’ve really enjoyed following! Or 1994 Bills as well. No, they shouldn't do it. Dundon also gets more blame because he made his fortune in the disgraceful field of subprime auto loans whereas Ebersol appears to be a bumbling failson. Both guys are despicable, but it's not hard to see why one of the two breeds more contempt.